Ben Wood enacts his Muybridge performance on September 21, 2013 at Other Cinema! The Man who Stopped Time is excerpted from Ben Wood’s current video about British photography pioneer, Eadweard Muybridge. Muybridge the California artist bears the traces of genius in his face and general get-up. As to the latter it is as artistique au possible; the loosely-tied neck ribbon, the velvet coat, the grey felt sombrero – these might be called Californian, were they not the true artistic style of the London and Paris ateliers. 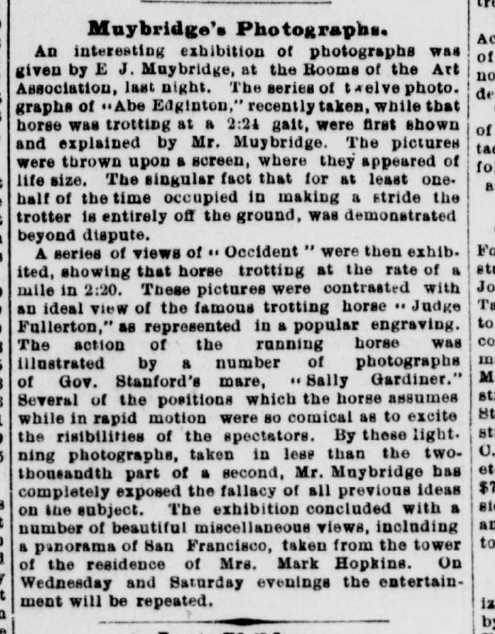 With grey hair carelessly tossed back from an intellectual forehead, bright flashing eyes and a pleasant mouth, Mr. Muybridge must himself make an interesting subject for a photograph, whether in motion or repose. I herewith enclose you a photograph made from a negative, which I believe to have been more rapidly executed than ever made hitherto. The exposure was made while “Occident” was trotting past me at the rate of 2:27, accurately timed, or 36 feet in a second, about 40 feet distant, the exposure of the negative being less than one thousandth part of a second. The length of exposure can be pretty accurately determined by the fact that the whip in the driver’s hand did not move the distance of its diameter. The picture has been retouched, as is customary at this time with all the first-class photographic work, for the purpose of giving a better effect to the details. In every other respect, the photograph is exactly as it was made with the camera.